to the individual that wants something different. Includes a Rosewood Tip & Cap, Palm Swell and High Comb. This sporty looking stock with its racy lines may be what you are looking for. Its challenging and exotic appearance appeals to the individual that wants something different. Our Sportster style can be shaped from our Custom Rollover by dropping the heel 3/8", raising the bottom of the cheekline 1/8", moving back top of the comb forward 1/4", sharpening the forward point of the comb, and altering the front and back of the grip for that definite hook. Select a Hardwood and Grade, or Select a Laminate Color to determine price. Select any Additional Options / Services or Accessories desired, and add the appropriate price. Add shipping and applicable sales taxes as outlined below. Your stock can be inletted for any of the actions listed in our Available Actions Section. CLICK here! for the list. There is no extra charge unless specified in the available actions section for rare models. Claro Walnut is used on all stocks unless a different hardwood is specified at time of order. LAMINATED WOODS--These Laminates are Very Strong, Stable, and Attractive. Made of 1/16" stained Birch veneers. 23 Colors to Choose From! Click for photos! Please Note: If the supplied blank is undersized, flat spots can occur on the cheekpiece, forearm, etc. Custom Barrel Channel -- Only for 96% inlet models we can cut a 1/2", 3/4", 1", or 1 1/4" straight channel on request for custom barrels. 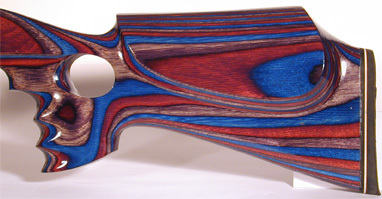 We cannot cut specific channel contours, or cut according to customer supplied dimensions. All stocks come with a standard small factory sized channel unless an optional straight channel cut is requested. PLEASE NOTE: All orders must be placed by mail, fax, or telephone. NOTE: If paying by Visa, Mastercard, Discover or Debit Card, the charge will be processed approximately two weeks prior to shipment. Name, Address, Daytime Phone Number, and Payment Info. 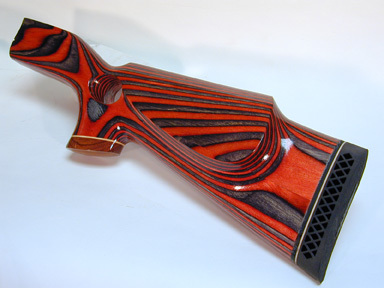 $17.50 for the 1st gunstock, Add $5 for each additional gunstock. Orders Shipped to Alaska & Hawaii are subject to additional freight charges. California Residents please add 9% Sales Tax to Order Total. A 20% discount applies on all prices except where noted. If for any reason you feel the merchandise isn't up to your expectations, just specify the reason in writing, and return the stock within 30 days, providing the stock has not been worked on or altered in any way. A full 100% Refund including Shipping Charges will be provided. Your satisfaction is our first and most important consideration. The AVERAGE Approximate Production Time is currently 6 to 8 weeks. For Left Hand Setups, Custom Setups, Target Style Stocks, or stocks for actions in low demand, please allow approximately 8 to 10 weeks for production - See Available Actions Section for details. (Allow 1 extra week for shipping) For a Complete Discussion of Our Production Times, please see the Common Questions Section of this website.